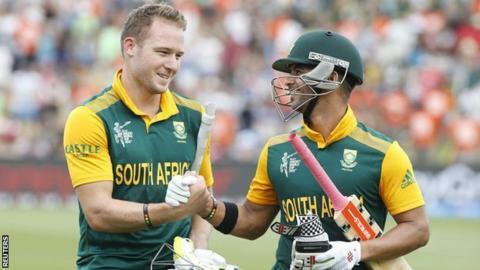 David Miller and JP Duminy made a record one-day international fifth-wicket stand of 256 as South Africa recovered to beat Zimbabwe in their World Cup opener in Hamilton. After a shaky start, Miller (138 not out off 92 balls) and Duminy (115 not out from 100) came together at 83-4. They blasted the Proteas to 339-4, including 111 off the last six overs, while Miller smashed 30 off the 48th. Hamilton Masakadza (80) helped Zimbabwe to 277 in reply, losing by 62 runs. South Africa - three-time beaten semi-finalists - were among the pre-tournament favourites, but were less than convincing here, despite winning their 27th consecutive ODI meeting with Zimbabwe. Hammered 5-0 by Bangladesh in their last ODI series, Zimbabwe were facing the highest successful run chase in World Cup history. Chamu Chibhabha (64) and Masakadza shared a century stand, with Masakadza reaching his fifty by hitting Dale Steyn for an audacious six over cover, until both holed out off leg-spinner Imran Tahir. When Masakadza fell, Zimbabwe needed 149 from the final 17 overs, which proved beyond them, though tailender Solomon Mire entertained the crowd with a couple of huge sixes before falling to a superb full-length catch by Proteas skipper AB de Villiers. "We really went for too much in the end," said captain Elton Chigumbura. "We didn't get the wickets we needed in the middle period and paid for it." Fresh from overwhelming West Indies at home, the tentative Proteas were four wickets down by the 21st over. Zimbabwe may even have sensed an upset when De Villiers was acrobatically caught by Craig Ervine on the long-off boundary for 25. "That partnership won't be forgotten. I was really impressed with the way South Africa applied themselves as they had to stick in and build a strong partnership. Their running between the wickets was excellent, and then it was some of the best hitting I've ever seen." Miller and Duminy rebuilt against Zimbabwe's spinners, the former hitting nine sixes and taking seamer Mire for 30 off the 48th over with three fours and three sixes, one of which went out of the ground. "I just needed to construct a partnership with someone, and JP was the man today," said Miller. "It was tough up front and a bit slow initially, but it definitely eased up towards the end." Duminy took until the final over to reach three figures, the highest one-day international fifth-wicket stand - and the third highest World Cup partnership for any wicket - reasserted South Africa's supremacy. While Zimbabwe extended their record number of World Cup defeats to 38, this performance will show they are no pushovers under coach Dav Whatmore, and they must have aspirations of beating an out-of-sorts West Indies side to a quarter-final berth. "We were in the game for a long time so it was a good sign for the games to come," said Chigumbura.